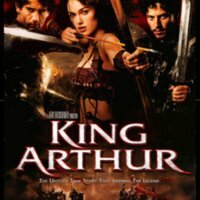 Antoine Fuqua’s King Arthur relies on the reputation of Arthur’s name, but hardly mentions any of the stories from Arthurian literature. Starring many renowned actors such as Keira Knightley, Clive Owen, and Ioan Gruffud, the film is loosely based on new supposed archeological evidence. Moreover, the film’s box office reception was dismal. With a budget of $120 million, it made approximately $15 million in its opening weekend. 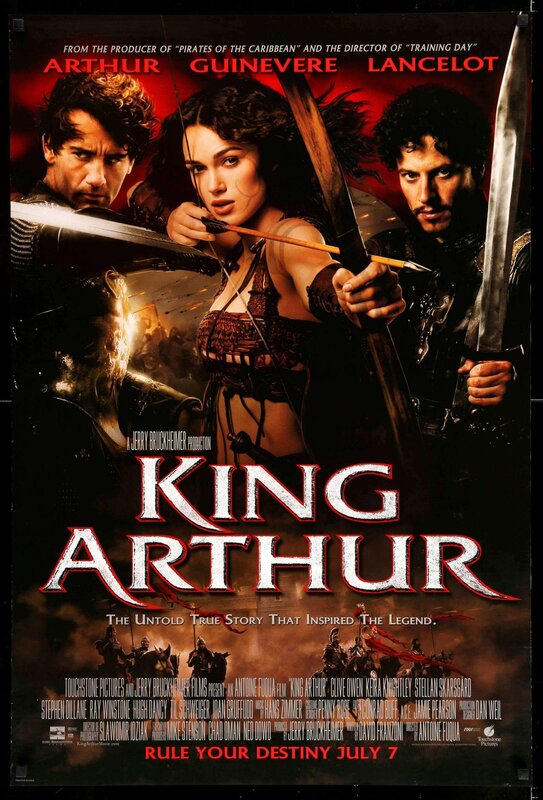 Movie critics and audiences alike cited numerous historical inaccuracies, stating: “The magic is gone, leaving a dreary, generic action movie.” While King Arthur does have plenty of action, its lack of character development, confusing plot, and overly somber scenes leave much to be desired. The film begins with Arthur and his knights, who are Sarmatians, battling the Woads, who have invaded Hadrian’s Wall. Arthur and his knights beat the Woads, in what was to be their supposed last duty as soldiers to the Roman Empire. They return to their home in Britain and meet with Bishop Germanus. Here, Bishop Germanus tells Arthur and his soldiers that the soldiers must perform one last mission, to save Alecto, the Pope’s promising successor, from an upcoming Saxon invasion upon the land. They are not free until they do so. Arthur and his men are reluctant since the mission is incredibly dangerous, but they agree. Upon arriving, Marius, Alecto’s father, refuses to leave. Arthur and his knights stumble upon a putrid prison there, where monks have been imprisoning pagans for their sins. Here, Arthur discovers Guinevere, who is a Woad. Arthur forcibly takes Marius and Alecto from the land, frees the prisoners, and takes whoever wants to leave the land up North. During the transport up North, Guinevere lures Arthur to Merlin and Merlin tries to convince Arthur to ally with the Woads against the Saxons. Arthur is reluctant, since Merlin killed his mother, but ultimately agrees. Notably, unlike his traditional role, Merlin does not have magical capabilities in King Arthur. They continue their mission, when Arthur’s men discover that the Saxons are near and attack them in an action-packed ice battle. They eventually end up North, and Alecto is returned to the Pope. However, Saxons have made their way up Hadrian’s Wall. Arthur and the knights, now freed, decide to fight, alongside the Woads, in one last battle against the Saxons. Guinevere also joins them in battle. It is worth noting that this battle, the Battle of Badon Hill, historically did not take place by Hadrian’s Wall, but rather by Bath. Many of Arthur’s men are killed, but Arthur defeats the Saxons and their leaders, Cerdic and Cynric. Similar to Arthurian legend, he marries Guinevere at the end of the film, and it is here that Arthur becomes King Arthur. In my opinion, much of the plot was underdeveloped. Arthur’s depiction as a Roman general is fine, as some Arthurian tales have depicted him in this way, but Sarmatian knights? Sarmatians, while they had affiliations with Rome, did not have any connection with the Arthurian legend. Arthur’s knights are usually British. In Arthurian legend, Guinevere is often depicted as a Roman, but here she is depicted as a Woad, a pseudonym created by Fuqua to represent the Picts. In most accounts of Guinevere, Guinevere is often depicted as a lady like figure, so Fuqua’s interpretation of Guinevere as a fierce warrior of the Woads was definitely interesting to watch. Then, there are the inherent religious inconsistencies. Both Pelagius and Germanus were enemies alluded to in the film, but they were religious figures decades before 467 AD, when the movies takes place. Also, it is unclear in the film why Arthur would be follower of Pelagianism. Additionally, the Pope did not instruct Roman military during this time, and was a comparatively minor political figure in the Empire. The famous Saxons of history, Cerdic and Cynric, also did not have any connections to the story. While medieval movies are not expected to be entirely historically accurate, King Arthur’s profound deviation from known history, as its filmmakers claimed to have made a historical accurate film, seems to work against it as a piece of entertainment and as a film claiming to be faithful to history. Chynna Hernandez, “King Arthur (2004),” Medieval Hollywood, accessed April 24, 2019, http://medievalhollywood.ace.fordham.edu/items/show/12.